1 of 1 Prepare grill with medium-hot coals, or heat gas grill to medium-high. 1 of 1 Stir apricot preserves, mustard, garlic powder, ginger and ketchup until combined. Set aside. 1 of 1 Remove skin from chicken legs. Season all over with salt and pepper. 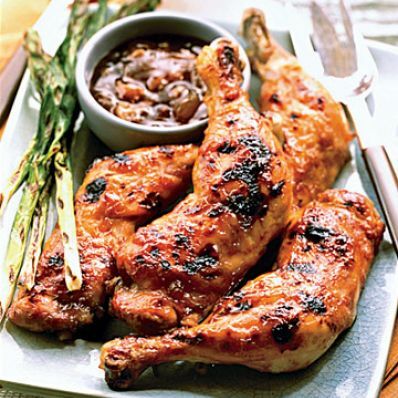 Grill 25 to 30 minutes, turning occasionally or until an instant-read thermometer registers 165 degrees F. Brush chicken with half the sauce during the last 5 minutes of cooking; serve remaining sauce on the side.